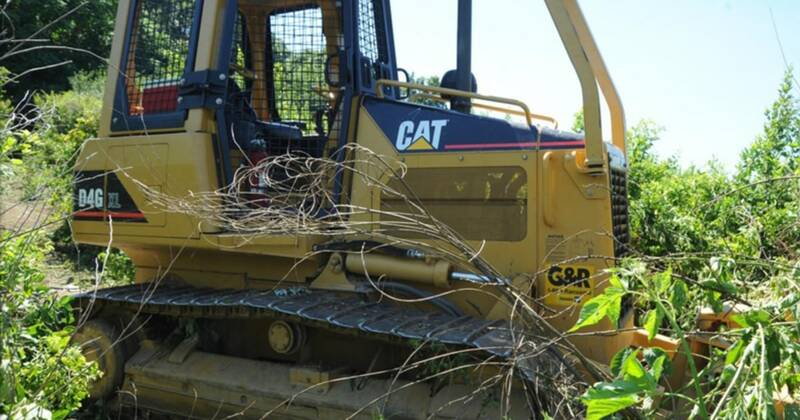 A man with 10 pot plants was crushed by bulldozer during police chase. His family is suing. “The state police and the Pennsylvania Game Commission worker ran Greg over with a bulldozer, crushing and killing him, all over some pot plants,” the lawyer for the man's family said. Berks County District Attorney John Adams told NBC Philadelphiathat the police response to Longenecker was appropriate. "His behavior was despicable," Adams said. "They yelled to him; they asked him to surrender. He did not surrender." And there it is folks. He was killed due to "contempt of cop". They didn't trot out the old canard, "The officer feared for his life." They didn't say it was an accident. The thing is, it is perfectly reasonable to understand that if he's being chased by a bulldozer and decides to hide in thick brush, he might accidentally be crushed because he can't be seen. But the cops don't even use that excuse. The only thing they can muster is "His behavior was despicable." Pathetic. Any cop involved in this should be out of a job and out of a pension. Interesting that your take on it is not even close to what was reported. No one intentionally ran him over. He was hiding in the bush, away from the police searching for him, and they were using a bulldozer to get through the bush. There's not a single claim of "they sought him out and ran him over and then left the bulldozer on him to kill him." It wasn't even the cops driving the bulldozer. This is why I challenge your assessments in other threads - if you can't get this one right, why should I trust your assessment of Putin's view of Trump's motives in a geopolitical way? Interesting that your take on it is not even close to what was reported. No one intentionally ran him over. Nor was that my suggestion, hoss. Nope, you said he was killed due to contempt of cop. That would imply the cops killed him (they didn't). That would imply he they knew what they were doing (they didn't). So, what was your suggestion when you said that? This is what got him squished, ""His behavior was despicable," Adams said. "They yelled to him; they asked him to surrender. He did not surrender."" And, you are incorrect to wit, "...a state trooper along with the game commission employee, (a game commission employee most likely was a game warden with full arrest powers, just like the trooper sitting next to him), followed him in a bulldozer." Trooper probably said, keep going, the hell with the screaming. Plus, if the guy could get through to where he was on foot, why couldn't a trooper or game warden get through it as well? And just where did they get a bulldozer from anyway? They are not just just sitting around in wait for such use chasing down people. And ... the State destroyed, and cleansed, the crime scene. And ... not too much of a "chase". The D4G XL has a max forward speed of 5.6 mph. And ... When the helicopter saw the position of the guy relative to the position of the bulldozer and transmitted that information, the trooper should have commanded the bulldozer to stop and stepped out and continued on foot to apprehend the fellow displaying, "despicable", behavior. The helicopter pilot probably said, "Hey Tim. It looks like the fellow scurried under a thicket right in front of you. Stop right there." Trooper Tim said, Hell with that, and told Ranger Rick driving the thing to continue until the screaming stops. Both of those cretins in the dozer should fired and be tired for murder. I think what killed him was the bulldozer on top of him, not his attitude. Not the interpretation of his attitude. A bulldozer. The question is, why was the bulldozer on top of him? TCrow's answer is that the police intentionally put it there. It appears to be your answer as well. There's simply no proof of such a thing from the article linked. And, you are incorrect to wit, "...a state trooper along with the game commission employee, (a game commission employee most likely was a game warden with full arrest powers, just like the trooper sitting next to him), followed him in a bulldozer." Trooper probably said, keep going, the hell with the screaming. That's a lot of supposition? It could equally be said that the game commission employee is an equipment operator who simply was in the area doing something else and was asked by po-po for help and gave it. In fact, that's even more likely. Plus, if the guy could get through to where he was on foot, why couldn't a trooper or game warden get through it as well? I don't know, but I would guess the tens of pounds of gear the police carry make them a little less nimble when trying to run through the woods. Additionally, they only had the motive of catching a suspect, whereas the suspect clearly had the motivation of not being caught, like his buddy. And just where did they get a bulldozer from anyway? They are not just just sitting around in wait for such use chasing down people. Which is why it is more likely the game commission employee was an equipment operator who happened to be in the area and not a sworn deputy. And ... the State destroyed, and cleansed, the crime scene. That's the accusation. Not sure how one would prove that. And ... not too much of a "chase". The D4G XL has a max forward speed of 5.6 mph. And ... When the helicopter saw the position of the guy relative to the position of the bulldozer and transmitted that information, the trooper should have commanded the bulldozer to stop and stepped out and continued on foot to apprehend the fellow displaying, "despicable", behavior. Is that what your years of searching for suspects in thick brush and training to do has taught you? I personally haven't had those experiences, or that training, so I go by common sense: The helicopter saw him, the guys chasing moved at a max forward speed of 5.6 mph, with the strong implication that the suspect (who was evading arrest) would continue to evade arrest and likely was not in the same spot due to the slow-moving, large, loud piece of machinery coming at him. Maybe the guy was dumb and got run over. Maybe the guy tripped and got knocked out and never knew it was coming. Maybe the guy had a death wish. Maybe the guy thought, "this is like a waterbed - the weight spread out over such a large area won't hurt me" and stayed in the area knowing the track was coming over him. Maybe he was stuck, but didn't want to give up his position so he stayed silent while the bulldozer came at him. Maybe he yelled "stop stop stop, I give up" but the bulldozer was so loud the cop and equipment operator never heard him. Maybe the cop and sworn deputy game commission bulldozer operator saw the guy and aimed for him and ran him over on purpose - moving at a max speed of 5.6 mph and the guy was too slow to move out of the way of the bulldozer. Which one of those things sounds most likely to you? Which one of those things sounds least likely? The helicopter pilot probably said, "Hey Tim. It looks like the fellow scurried under a thicket right in front of you. Stop right there." Trooper Tim said, Hell with that, and told Ranger Rick driving the thing to continue until the screaming stops. Both of those cretins in the dozer should fired and be tired for murder. Yeah, in the whole wide world of "probably", that's certainly within the realm of possible, but way outside the realm of probable. In addition, since we know that those "law enforcement" helicopters are now equipment with state-of-the-art FLIR (Forward Looking Infrared) camera and as such, these cretins absolutely knew the location of the "despicable" citizen. I don't need a news story missing a sh*tload of necessary information to piece together what happened. According to the complaint, they "commender" a bulldozer. I do stand corrected on one point, per the complaint, it was a non-law enforcement Game Commission employee. Sadpussi!! I knew you'd show yourself eventually!! You keep popping up, just like Herpes!! So Sadpussi...any updates on the Jussie Smollett hate crime that he committed? In addition, since we know that those "law enforcement" helicopters are now equipment with state-of-the-art FLIR (Forward Looking Infrared) camera and as such, these cretins absolutely knew the location of the "despicable" citizen. Link to this one having that, it working, and being utilized? I don't need a news story missing a sh*tload of necessary information to piece together what happened. Well, sure, I mean why would you need facts to know anything when supposition can give you all you need? Not all helos are so equipped, given the cost of the FLIR turrets. So that's not certain. And FLIRs are not perfect, heavy vegetation can indeed cloak a person. And your made up comms between the helo and the officer on the ground was just that, made up. If your position requires you to make stuff and insist it's real, you dont have enough facts. Was this guys death wrongful? Could very well be. Could also be a case of playing stupid tricks and winning a stupid prize. There is a picture of the Pennsylvania State Police helicopter in question which indeed does have said equipment installed. Also, it is stated, that the helicopter pilot was hovering directly over the "despicable" citizen yelling commands over the helicopter's loudspeaker to give up. There is something about LE using a bulldozer to find a perp. A combine with a wheathead would have been more humane. I'm hypothesizing a possible and plausible scenario. It's clear you were hypothesizing, not reading the report. It's clear that your hypothesis is possible. It's entirely unclear that it is plausible. At least, it does not seem more plausible than a plethora of other possibilities that you are not entertaining in your mind. Just the fact that you have to hypothesize implies you know you don't have sufficient facts to form a good opinion based on knowledge of the incident. Ok, how's this. I do not believe the official narrative coming from the government apparatchiks. They've circled the wagons. My implied scenario's are just as likely as theirs. And since the narrative is coming from government apparatchiks, one cannot believe that anything they say are are facts, outside of a court room, and even then it's questionable. It is my belief that they failed miserably in protecting human life. Commandeered a bulldozer that personnel may, or may not, have been licensed or certified in the use of. Unlawfully used tactics with zeal to apprehend a "despicable" citizen resulting in death over some plants. When, they could have just waited until later when the "despicable" citizen decided to go home, or come out on his own at a later time. Ok, how's this. I do not believe the official narrative coming from the government apparatchiks. Makes sense - we can definitely agree on that. My implied scenario's are just as likely as theirs. And since the narrative is coming from government apparatchiks, one cannot believe that anything they say are are facts, outside of a court room, and even then it's questionable. It is my belief that they failed miserably in protecting human life. Commandeered a bulldozer that personnel may, or may not, have been licensed or certified in the use of. Where was the law broken? Seems to be 100% fact-based. When, they could have just waited until later when the "despicable" citizen decided to go home, or come out on his own at a later time. It's too bad their training didn't tell them to just wait until suspects all go home or decide to stop evading arrest. I'm not sure that's always the best option, but I will defer to your training and expertise. I doubt a police officer will, though. He couldn't hear the good officers yelling that over the rumble of the Caterpillar diesel. Based on years of eventually found out, lies, misconduct, planting, and fabrication, of evidence, withholding of, or destruction of, exculpatory evidence, by either police or prosecuting attorneys, etc..